“He wants me to dress from head to toe all in black,” she said waving her hands in the air, “like those moms from the (insert here – name of rival ski mountain).” I felt her husband’s eyes scan me from head to toe. I didn’t have to look down to know what he was seeing – I was dressed all in black, from hat to ski boot. I can’t tell you anything about the rest of the conversation, because I was stuck on crunchy and sprouty, picturing the alfalfa sprouts growing in a glass jar on my kitchen counter. Later that day I sat in the ski lodge, still thinking about that conversation and remembered the creative writing lesson I’d taught several years before. After passing out pages of blank white shipping labels, I asked my students to write down any labels that had ever been placed on them – by others or themselves – good, bad or somewhere in between. After writing down all the labels (me, too) we peeled off the stickers and placed them all over ourselves. Words like Weird, Strange, Brainy, Cool, Crazy, Stupid, Cute, Ugly, Chubby, Sweet, Selfish, Creative, Athletic, Funny, Odd, Quirky, Artistic and Wild covered our shirt sleeves, pant legs, shoes and foreheads. Then came the fun part. We examined each of our labels and decided what to keep and what to peel off, tear up and throw away. I have to say, there’s nothing quite like watching a 7th grader rip up the labels Freak and Weird and proudly wear Funky, Imaginative and Unique instead. 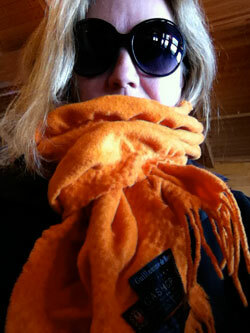 And with that in mind, I dug down to the bottom of my ski bag and pulled out the fancy orange scarf with the designer label that I’d never worn. I looped it around my neck and felt the possibility of myself sprouting into something else.